Located just 100km south of Barcelona on Spain’s Costa Daurada (golden coast) Tarragona is literally bursting with history. The Roman city of Tarraco was capital of Hispania Tarraconensis and was one of the most important cities in the Roman Empire. 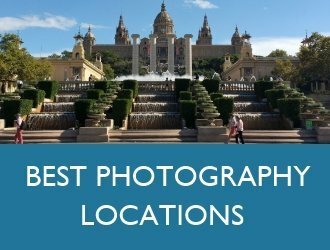 The most important historical sites are located in the city centre and Tarragona is one of the most popular day trips from Barcelona. If you have time, I recommend that you spend at least one night here so that you can enjoy the city at a more relaxed pace and visit sites such as the Roman aqueduct which is located just outside the city. 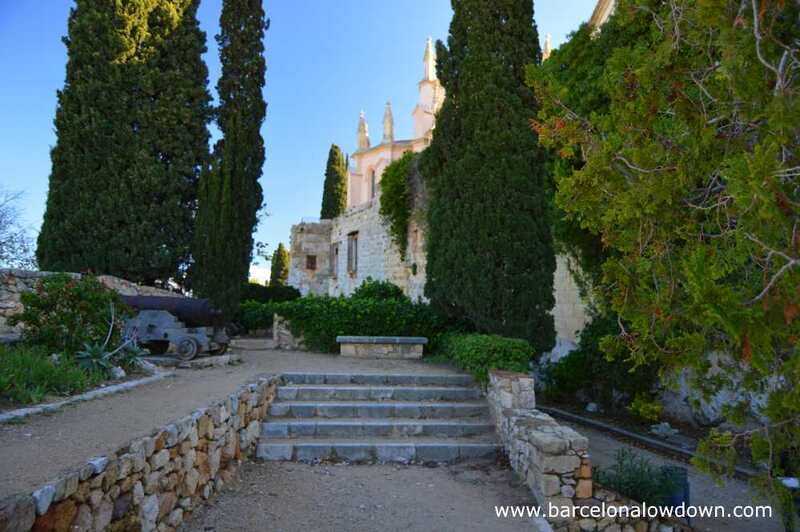 Alternatively you could use Tarragona as a base to explore the surrounding region. 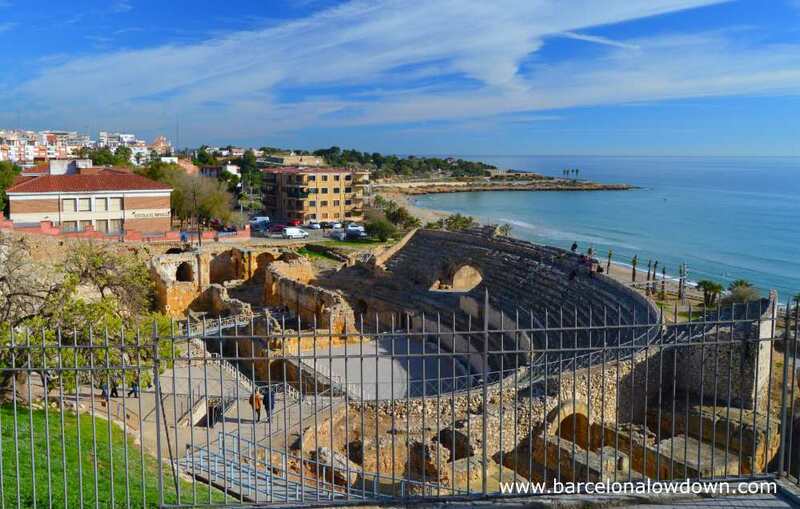 The best known of Tarragona’s 13 UNESCO listed Roman remains, the amphitheatre was cut into the hillside leading up from the beach at the start of the second century AD and used to stage Gladiator contests and public executions. In 259 AD, during the persecution of Christians, the city’s archbishop Fructuosus and his 2 deacons were burned alive here. Years later, when Christianity became the official religion of the Roman Empire, a basilica dedicated to the 3 martyrs was built in the middle of the by then disused amphitheatre. In the 12th century, the Visigoth basilica was replaced by a Romanesque church, the remains of which can be seen today. Entry to the amphitheatre costs €3.30 or you can purchase the MHT pass which costs €7.50 and includes the Roman amphitheatre, Roman circus, the local forum and the city walls archaeological walk. 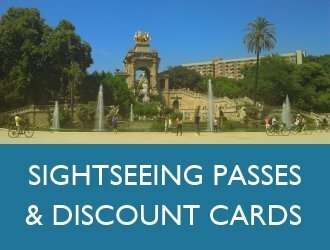 The pass can be purchased at the ticket office of any of the 4 sites and at Tarragona tourist information offices. The Roman circus was a hippodrome built to stage chariot races, theatre and circus. The structure dates back to the first century AD and was 350m long by 115m wide with a seating capacity for 30,000 spectators. Most of the circus now lies hidden beneath the medieval city centre and all that remains are sections of the walls and some of the tunnels which originally gave access to the stands but now run beneath the surrounding streets and buildings of the city centre. The site includes the Praetorium tower which was once part of the Provincial Forum and which affords excellent Panoramic views of Tarragona. 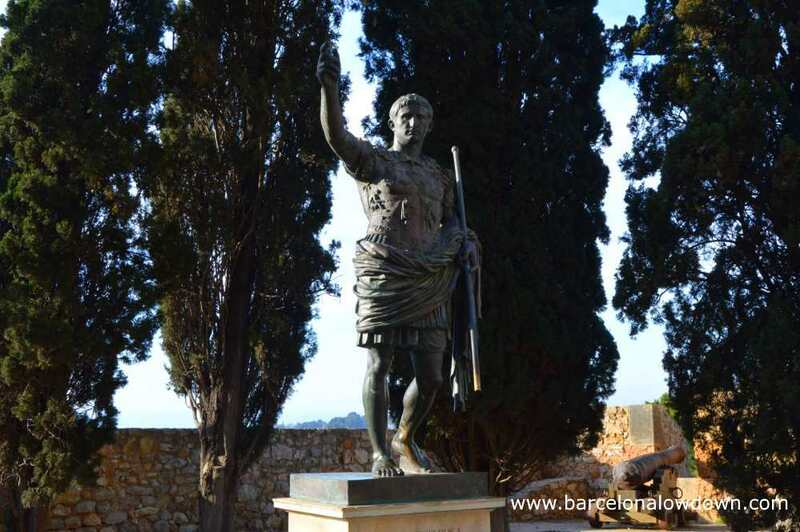 Together with the archaeological museum, a visit to the Roman Circus will help you appreciate the size and importance of Tarraco during the times of the Roman empire. Located in an area of woodland 4km from the city centre, the Roman aqueduct (Pont de les Ferreres) can be reached by bus or on foot. 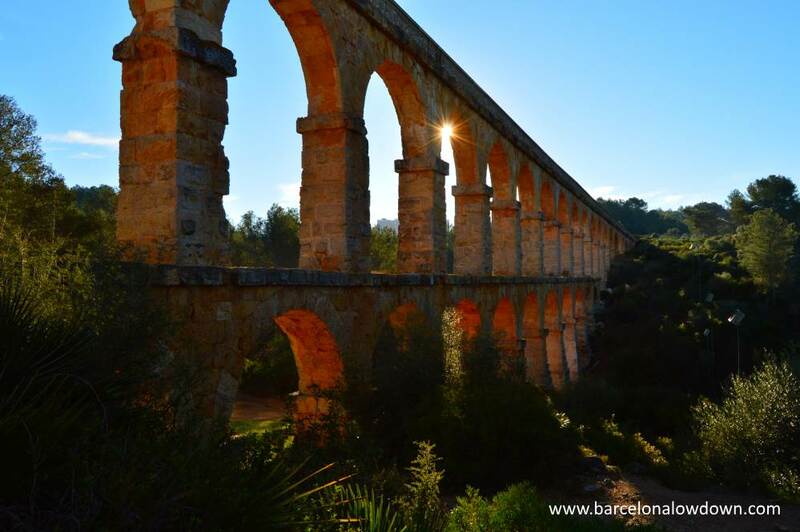 A testament to Roman engineering the aqueduct supplied water to Tarragona right up until the 18th century. More information here. Tarragona’s small but interesting archaeological museum houses a collection of statues, mosaics tombstones and other objects used in daily life. The entrance ticket also includes the Roman necropolis in the south of the city. Roman forums were market places surrounded by temples and public buildings. Tarragona’s forum local (local forum) was located in the residential part of the city (Catalan: Part baixa). The forum was excavated during the 1920s and you can see the remains of the basilica, cistern and several Corinthian columns. 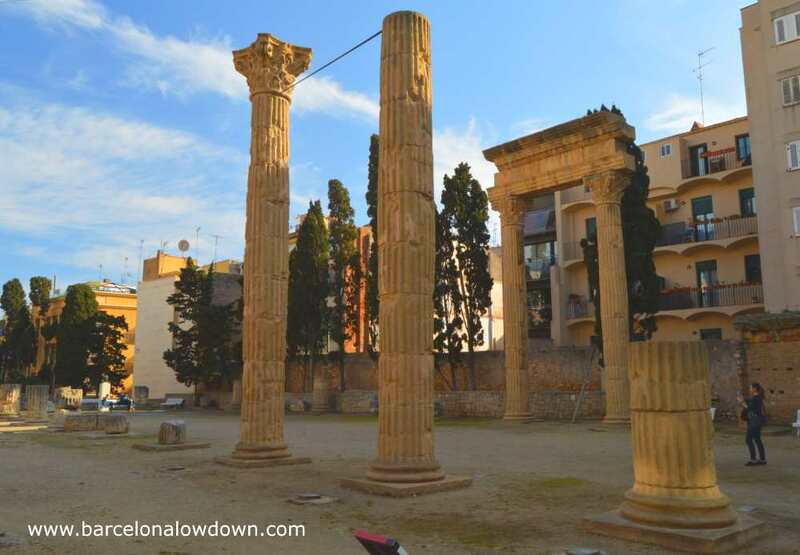 The Provincial forum dates back to the 1st century AD when Tarraco was the capital of the Roman province Hispania Tarraconensis. 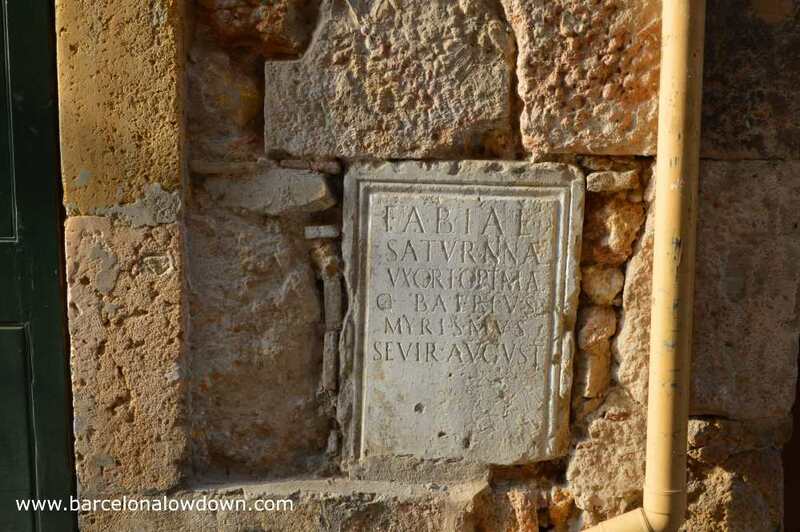 The forum covered a large part of what is now the medieval city centre including the site of Tarragona cathedral. 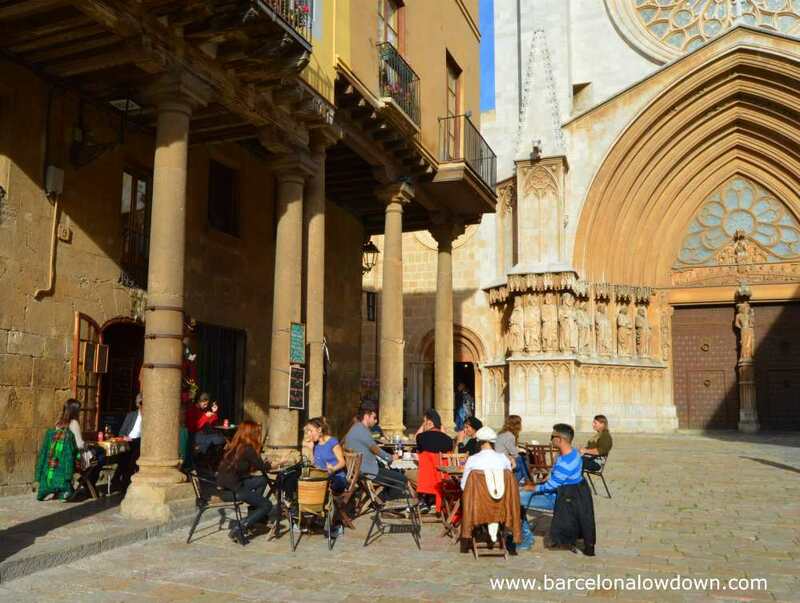 Today Plaça del forum is an attractive square surrounded by small bars and restaurants with tables where you can sit out side and enjoy a beer or leisurely meal. On Saturdays the square plays host to a lively food market with stalls selling fresh fruit and vegetables. The Cathedral of Santa Tecla was built during the 12th to 14th centuries on a site which had previously been occupied by a Roman temple dedicated to Emperor Augustus, a Visigoth Cathedral and a Moorish mosque. The cathedral is a mixture of Romanesque and Gothic styles and contains a large collection of religious art including sculptures, paintings and textiles. 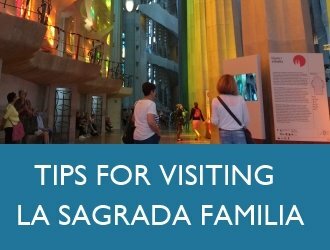 Highlights include the carved Gothic façade and large stained glass rose window, the altar dedicated to Santa Tecla and the rectangular cloisters and gardens. Entry to the Cathedral and museum costs; adults €5 students €4 OAPs/ children €3. 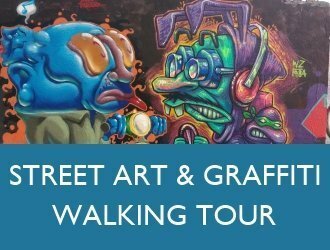 Audio guides cost €2 and guided tours are also available. 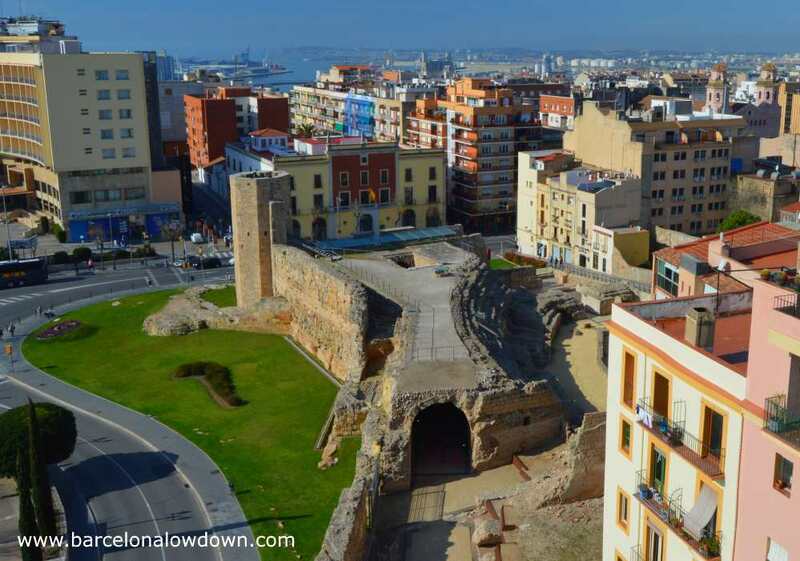 The Roman walls which surrounded Tarraco were built during the second century BC, making them the earliest Roman construction outside of Italy. During the 16th to 18th century an outer wall with pointed bastions was built to protect the city from artillery fire. Today approximately 1.2km of the walls remain and have been restored and converted into gardens. 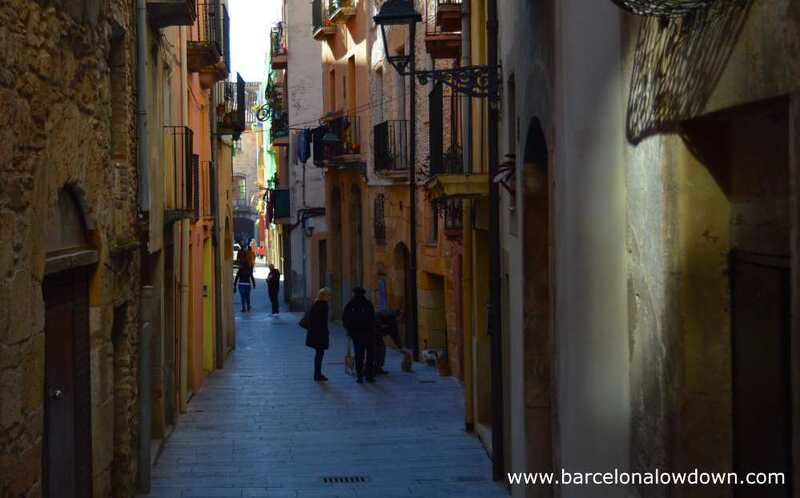 The medieval city centre which surrounds Tarragona Cathedral is a labyrinth of narrow cobbled streets and shady plazas. It’s a delightful area to explore at a leisurely pace, stopping to enjoy a glass of vermouth, cup of coffee or cold beer as you soak up the atmosphere and try to imagine what it must have been like to live here during the middle ages or the times of the Roman Empire. Rambla Nova is a wide pedestrianised avenue which crosses Tarragona from the Plaça Imperial to the Balcó del Mediterrani. Relaxing and crowd free, the Rambla is an enjoyable place to walk, dotted with modernist buildings and statues including the Monument to Castells (human towers) and the statue of Roger de Lluria. El Balcó del Mediterrani affords views of the Roman amphitheatre, the beach (Platja el Miracle) and the Mediterranean sea. Local tradition says that the act of touching the characteristic iron railing brings good luck. 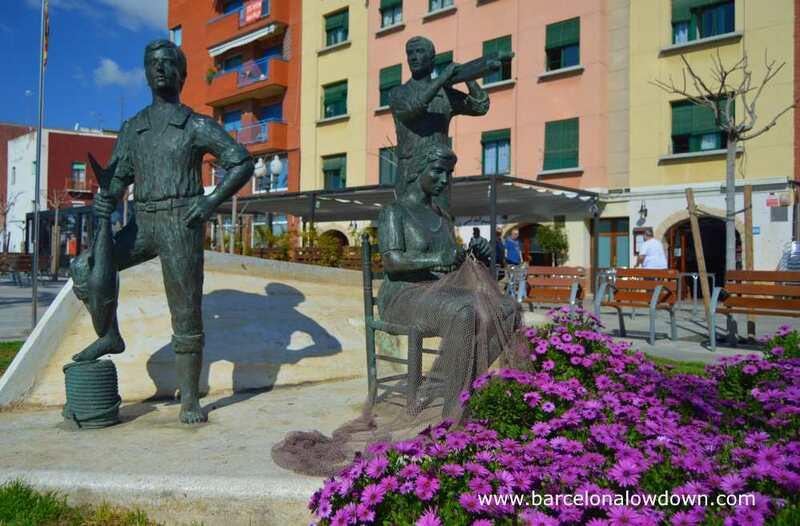 El Serrallo is the old fishermen’s neighbourhood located beside Tarragona harbour. The area is popular among locals who come to eat in the numerous seafood restaurants. It’s a pleasant area to explore, check out the fishing boats and people watch. 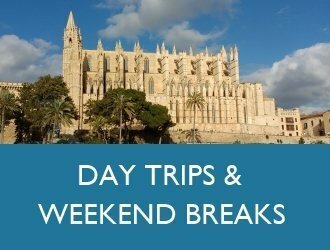 Attractions include the electric cranes which were used to load and unload ships, the historic harbour clock, the church of Sant Pere and the fishermen’s guild (now a restaurant). There is also a small museum dedicated to the maritime history of Tarragona. Tarragona was first settled by the Iberians during the 5th century BC. In 218 BC during the Second Punic War the town was taken by the Romans who established a military base and port. In 27BC Emperor Augustus travelled to Spain to oversee the conquest of Cantabria. Due to his poor health, Augustus preferred the milder Mediterranean climate of Tarraco and the city expanded rapidly. For the following two centuries Tarraco was one of the largest and most important cities in Hispania. After the decline of the Roman empire the city was occupied by Vandals and Visigoths until it was conquered by the Umayyad Caliphate in 714 during the Moorish conquest of Spain. 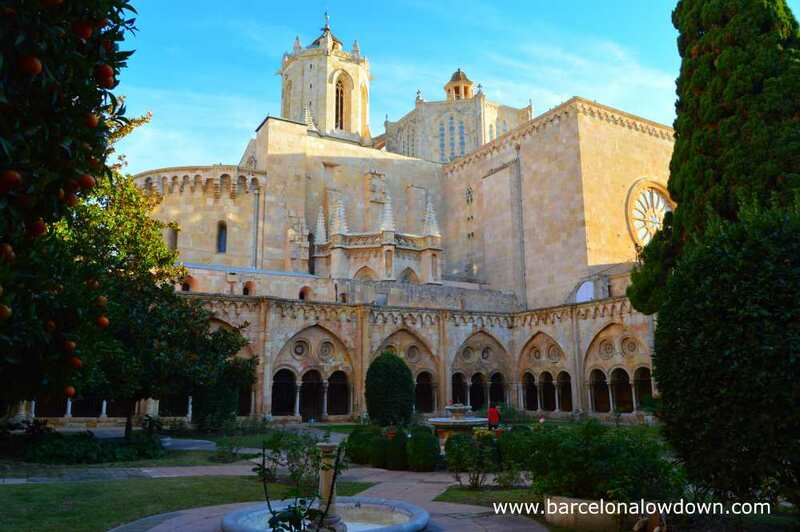 During the Middle Ages the city became an ecclesiastical enclave and important religious buildings were constructed including Tarragona Cathedral which was built on the site of the Roman temple of Augustus. Tres Tombs The feast day of Sant Anthony Abat (January 17th) is celebrated with a horse parade called the 3 turns (Catalan: tres tombs). Carnaval In February Tarragona stages one of Spain’s largest carnival parades. Dixieland festival One of the largest jazz festivals in Spain takes place in Tarragona during April. Tarraco Viva Each summer during May, Tarragona celebrates it’s Roman heritage by staging a series of events including gladiator fights, processions and chariot races. Corpus Christie This traditional Catholic festival is widely celebrated in Spain at the start of summer, dates vary from year to year. Feast of St. John (Revetlla de Sant Juan) On the night of June 23rd Tarragona celebrates the summer solstice in style with fireworks, bonfires and parties which last until daybreak. 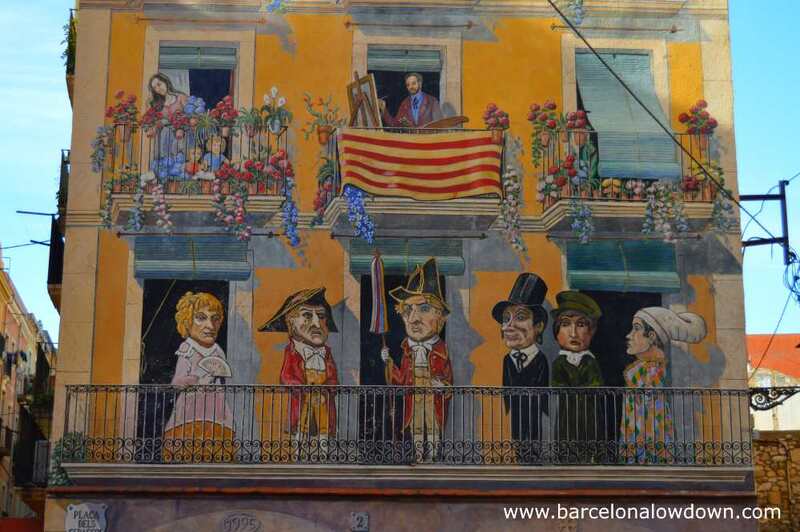 Santa Tecla Tarragona’s festa major in honour of the town’s patron saint, lasts for ten days either side of September 23rd. The celebrations include human towers, fire runs and processions of giants. Concurs de Castells (human towers competition) This spectacular event takes place in Tarragona every other year in October. The next competition will be in 2018. Other human towers events take place throughout the year. Devil’s bridge As mentioned above, in my opinion the Pont del diable aqueduct is one of the must sees when visiting Tarragona. Tamarit castle This small castle perched on a headland was built in the 11th century and restored in 1916. Altafulla Altafulla is a charming village with a castle and sandy beach which can be easily reached by train from Tarragona. Montblanc In April this tiny medieval town stages one of the best known medieval fayres in Catalonia. Sitges Located half way between Barcelona and Tarragona, Sitges is famous for it’s film festival, carnival, beaches and gay scene. Poblet Monastery The 12th century Cistercian monastery of Santa Maria is located 50km inland from Tarragona. Statue of Mazinger Z You need your own transport if you want to see this giant statue of the 1980s classic Manga robot which is located in Cabrere del Camp 40 km from Tarragona. Port Aventura. Spain’s largest theme park which attracts over 4 million visitors each year is located just 12 km from Tarragona. 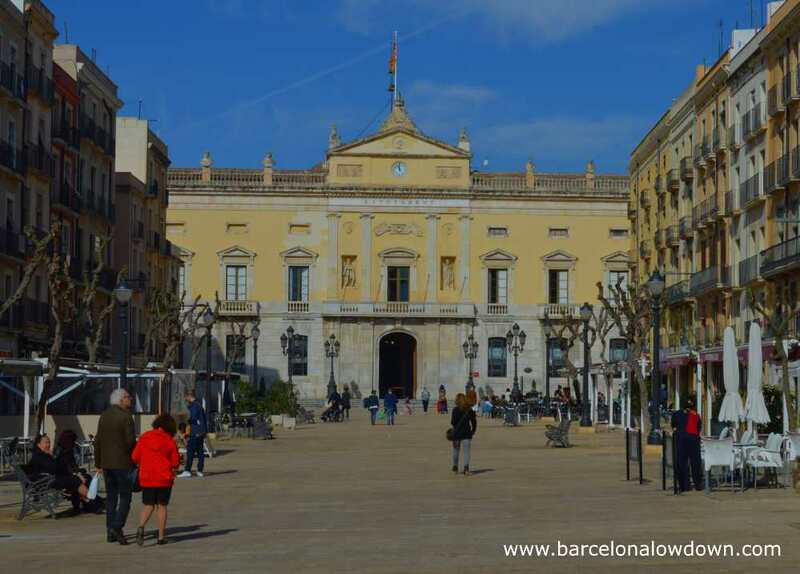 We’ve visited Tarragona 3 times and our favourite place to stay is Hotel Plaça de la Font which is a small budget hotel right in the centre of the old town in a charming plaza near to the main sights. The rooms are comfortable and spotlessly clean. It’s worth paying the supplement to stay in one of the rooms at the front of the hotel which have balconies overlooking the plaza. There’s free wifi in the rooms and free maps of the city available at the reception. The staff are friendly, helpful and ready to answer questions. If you are travelling by car, there is a public car park located beneath the square. The entrance to the car park is just a few metres from the hotel. There are 2 vegetarian restaurants in Tarragona: El Vergel and L’Espiga d’Or. El Vergel (Carrer Major 11) is a 100% vegan restaurant located in the medieval city centre, a short walk from the cathedral. The restaurant is bright airy and relaxed. Food is mostly vegan versions of Mediterranean cuisine. They also serve pressed juices, speciality teas and locally produced vegan wines. L’Espiga d’Or (Carrer Antoni Rovira i Virgili 17) is a health food store with a small restaurant at the back. The restaurant has some good reviews on Happy Cow but unfortunately we haven’t had the chance to eat there since we have always visited Tarragona at the weekends and the restaurant closes at 2pm on Saturday and doesn’t open on Sundays. Another good choice is Filosofía Restaurante (Plaça d’en Ripoll 6) which specialises in steaks and burgers but also has a couple of very good veggie burgers on the menu. Ideal if you are travelling with carnivores! The restaurant is deservedly popular and if you are visiting Tarragona at the weekend and plan to eat here you should reserve in advance. The journey from Barcelona to Tarragona by car takes approximately an hour and twenty minutes via the C32. Tolls for this route cost around €12. There are frequent trains from Barcelona Sants to Tarragona train station. Regional express trains take approximately one hour, tickets can be purchased at the train station and cost €8.05. There are also. commuter trains and long distance Talgo trains. The train follows the coast for most of the journey and affords good views of rocky coves and sandy beaches. 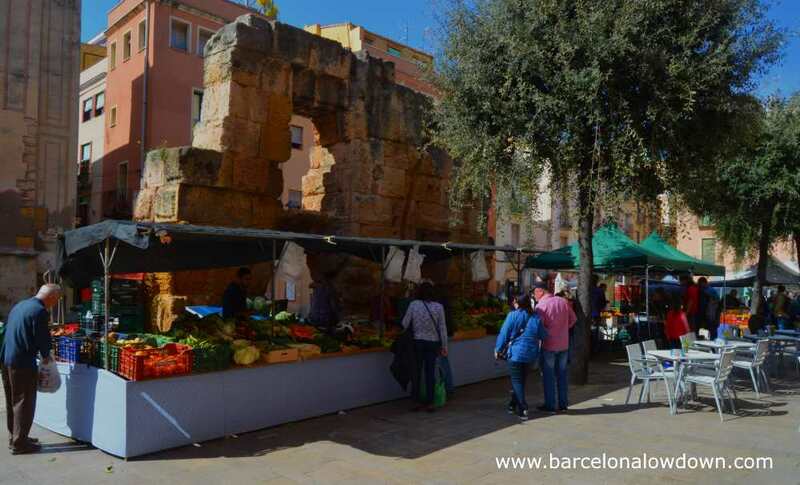 Tarragona train station is a ten minute walk from the city centre. As you exit the train station turn right, after a few metres you will come to a stone staircase on the left hand side of the road which will take you directly to the Balcó del Mediterrani and Rambla Nova. There is a taxi rank in front of the station, all taxis are metered. The high speed AVE and Alvia trains are not a good choice when travelling from Barcelona to Tarragona since instead of stopping at Tarragona train station they stop at Camp de Tarragona which is 16km from the city. If you’ve already bought your ticket, there are buses and taxis from the train station to the city centre. 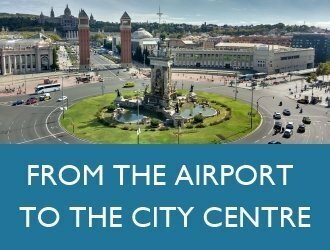 Alsa run seven buses per day to Tarragona from Barcelona Estacio del Nord and Barcelona Sants bus stations. The journey takes between one and a half hours and one hour forty five minutes. The fare is currently €8.76. Busplana run 14 buses per day from Barcelona airport (terminals T1 and T2) to Tarragona. The journey takes one hour and fifteen minutes and costs €13. High speed AVE trains take 2 hours between Madrid and Camp de Tarragona station which is 16km outside the city and connected by bus and Taxi. Ryanair and other low cost carriers offer cheap flights from the UK to Reus airport which is just 7km from Tarragona. Hispano Igualadina run direct buses from the airport to Tarragona. The fare is approximately €3, buses are scheduled to coincide with flights but I recommend that you check to make sure. Another alternative is to catch the local L50 bus to Reus and travel from there to Tarragona. A taxi from Reus airport to Tarragona will cost around €30. Viator offer small group day trips from Barcelona to Tarragona and Sitges including the Devils Bridge aqueduct. Lots and lots of thanks for the help I will come next week to see all the beauty of Barcelona and Tarragna. You’re welcome. Have a great time! Next week I will be in Tarragona and wanted to know where it Plaça dels Sedassos relative to the Rambla. From Rambla Nova walk north along Carrer de Sant Augustí. When it crosses Rambla Vella the road changes name to Carrer del Portalet and then a bit further on it changes name again to Baixada de la Misericòrdia. Shortly after the road changes name to Baixada de la Misericòrdia and just before it curves round to the right you will see Plaça dels Sedassos on your left. The painted house with the mural is in Plaça dels Sedassos square which I’ve now added to the map at the end of the article. The statue of Emperor Augustus is on the left hand side about a third of the way along the archaeological walk of the Roman walls. The entrance to the Roman walls and the Balcó del Medeterrani are both labelled on the map.